When I returned from Germany last December, after the Nephilim/Nuns tour, I felt like I had left my mind there… I wanted to return as soon as possible. 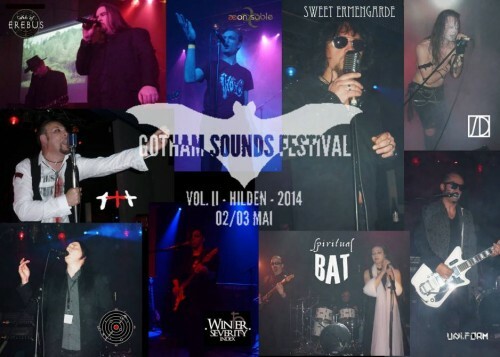 Gotham Sounds Festival Vol. II was the perfect opportunity, as this year’s fest was really promising. Two days of high class goth/wave music, including some of the best bands of the underground goth scene. So after a small rest, it was Red Sun Revival’s turn… I can’t be objective about this band, as I am totally addicted to their tunes. This was the only band of the fest that I had seen on stage twice already. They released the best album of 2012, according to my opinion. We are talking about a band that delivers pure romantic goth music in a unique way, expressed through Christina’s violin, Matt’s great guitars, Panagiotis’ gothy bass lines and of course their multi talented frontman. Rob, as always, was very expressive on stage, even if he was a bit static. He was singing with passion every song they played. They didn’t have enough time to play their whole debut album, so they left a couple of songs out of the set. Still, they managed to play two new songs from their forthcoming EP, both of them being masterpieces. Especially “Mistakes” is going to be their new club hit I guess… just brilliant! Last but not least, special mention should be made to the mosh-pit during their much loved anthem “My Child”. It was really fun to see people in the first rows jump all together, hugging each other… Great moments! Read the full review of the festival here.